Edgar Degas had a passion for theatrical subject matter. Whether it was the stage, racecourses, music halls or cafes, he loved to sketch models in the spontaneity of daily life. His somewhat daring style was what he called Realist. He eschewed the Impressionist style that are prevalent at the time and his paintings later inspired the works of Toulouse-Lautrec and Picasso. 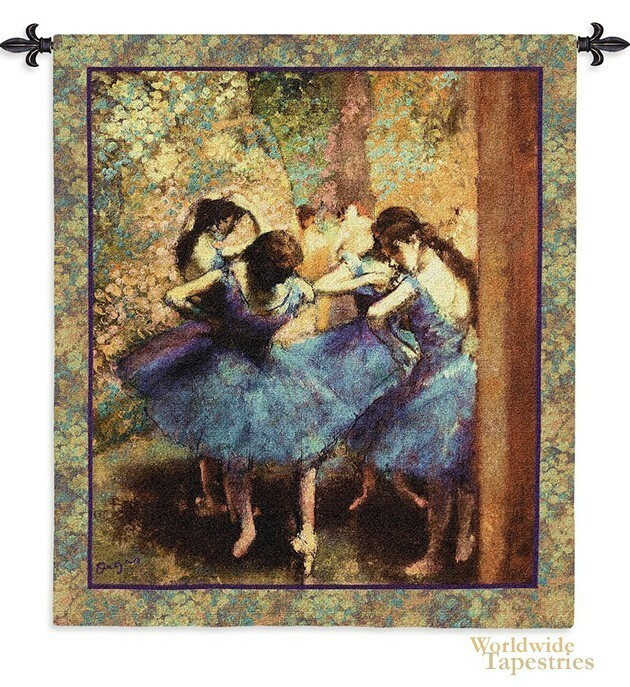 Dancers in blue is one of his most familiar works of art. The dancers are seen doing warm ups before going on stage. Degas would do initial sketches on site and then finish the paintings in his studio. His unusual use of angles and terrific composition are readily apparent in Dancers in blue. This tapestry is lined on the back and has a tunnel for easy hanging. Note: tapestry rod and tassels, where pictured, are not included in the price. Dimensions: W 45" x H 53"